Tiffany Yu Founder of Diversability. Social entrepreneur. Ex-Goldman Sachs. Last month, I attended the 48th World Economic Forum Annual Meeting in Davos, Switzerland, an annual gathering of international politicians, business leaders, and some of the brightest minds in academia and civil society. Not only was I one of the 3,000 participants, I was also a speaker on the formal agenda, speaking on bias and diversity, social media movements, inclusive design, and disability. This was the first year that a series on disability inclusion had been included on the agenda. 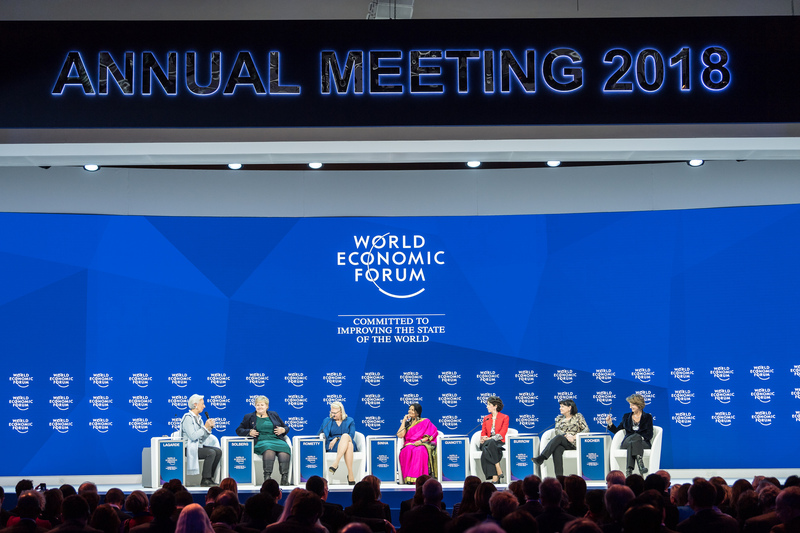 This was the highest percentage of female attendees at Davos ever. And this was the first year all seven co-chairs were women. But there is still a lot more work to be done. Critics have claimed that the meeting is nothing more than an exclusive gathering of global elites. Given I’m not a “global elite,” opportunities like this don’t come everyday for people like me. I’m a person of color. This is a term more widely used in the United States, but given that’s where I live, I’m considered a “minority” based on my racial identity as Asian. While my passport says I am American, my mom is a refugee from Vietnam (viewed as an underrepresented minority) and my dad is from Taiwan. There are only 19 countries that recognize Taiwan as a country. My country of birth and of residence, the United States, is not one of them. I’m a woman. Twenty one percent of the attendees were women. That number included spouses. Women represent about half of the world’s population. And if I’m reading the chart correctly, I was one of the six 29-year-old women there. I’m young. The average age of the attendees at Davos was 50–54. I’m 29. I was selected to attend the Annual Meeting through the Global Shapers, an initiative of the World Economic Forum to empower people in their twenties to self-organize for impact and amplify the youth voice. The world's youth population is at an all-time high at about 1.8 billion people. Fifty Global Shapers were selected from submissions across almost 400 cities globally to represent the youth voice. “There were no mirrors.” That’s what my Georgetown professor said to me when we caught up over the phone, reflecting on this once-in-a-lifetime experience. I didn’t see anyone else who looked like me, and the responsibility to represent all the underrepresented aspects of my identity was a lot to bear. It’s been awhile since I’ve been at a forum without people who look like me. I’m a member of the Global Shapers, which consists of members in their twenties. I’m part of some amazing women’s communities like Dreamers // Doers, and I run a company focused on building communities of people with and without disabilities. I also live in San Francisco, a city where over 35% of the population identifies as Asian (compared to 6% of the overall U.S. population). Whether it was asking why all 11 speakers at a lunch event were male (though this was a side event and not part of the formal agenda, one woman was added after the organizers let me suggest some women), to suggesting to the WEF team that they include accessibility information publicly on all the venues/event invites after a friend had asked me privately about it, to asking why a question from someone from Taiwan had to be listed as “Taiwan, China” (it was changed in a repost) — you get the idea — so much of my existence at Davos felt like an uphill battle. Whether I wanted to be or not, I was the teachable moment, across all of my identities. This was the first time I really experienced intersectionality at play. To me, it was a test of resilience. In my disability advocacy work, I often share the story of my “why” — the car accident twenty years ago that made me disabled and the same car accident that took the life of my father and shattered anything that looked like a semblance of a childhood for me. Twenty years later, I’m still healing. For anyone who has to relive and share the hardest thing that has ever happened to them five days in a row, that takes a lot of vulnerability, and in this case, not much time to refresh, reset, and recover. The final days of Davos showed me how crucial it was to curate the attendee population in a way that reflects our diverse world. On Thursday, the Global Shapers had been invited to a “Meet the Leader” discussion with a leading world figure. The WEF staff knew that I would be late due to the timing of one on my sessions and had notified someone on the speaker’s team. Unfortunately, due to a miscommunication, the message wasn’t relayed to the person I met from his team when I got there. “I don’t know who you are. I don’t know who that person from WEF is. You can’t go in. This doesn’t work like that.” He said to me, in what I interpreted was a pretty aggressive tone. Words that are haunting me days after the end of the meeting. So there I was, a multi-billionaire on other side of the door having no idea what was happening just outside. It felt symbolic to me. In a place where I had been invited and was expecting to be welcomed, I was told that I was not allowed. I don’t know if this had anything to do with me being a young woman of color with a disability, but I was already feeling so fragile. In that moment, he made me feel so insignificant, powerless, discarded, and I broke. It takes a lot for someone like me to break, who has spent the past two decades trying to rebuild my armor. 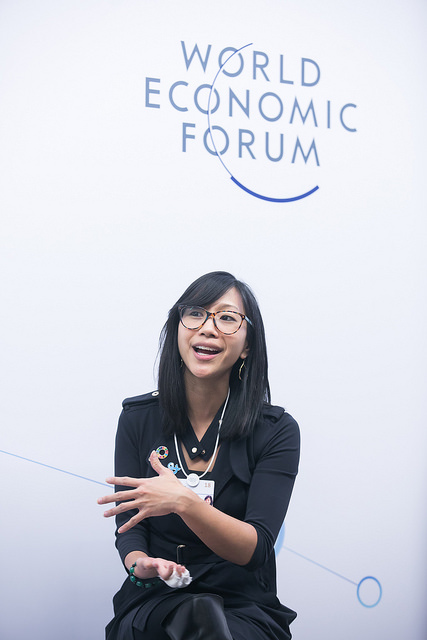 The theme of this year’s meeting was “Creating a Shared Future in a Fractured World.” That experience, and my existence at Davos, reminded me of how much of the world is fractured, and not welcoming of me, my community, and everything I represent and how much more space I have to take up just to be heard. Taking up space is exhausting. And sadly, feeling unwelcome is an everyday reality for people who look like me and many others who don’t in other marginalized communities. Inequality and barriers don’t exist just because I’m a woman, or just because I have a disability. It’s all these aspects, stereotypes, and social factors at play which compound on each other. There are people who are still waiting outside, on the edges of society. We talk about them like we understand their experiences and assume what they need, but how about we let them in and hear what they have to say? Who will be there to open to the door? I’m hopeful that my presence at Davos mattered. I’m glad that I showed up and I gave this experience everything I had. Access and opportunity make a world of difference in my communities, and I’m hoping that this is just the beginning of more people like me getting invited to the table. It will be hard and intense, but it will be worth it. I hope that the next person trailblazing her way through Davos knows that I am part of the community there with her in spirit, rooting for her. I look back at the theme of this year’s meeting, creating a shared future. It starts with opening the door. Show up for people who don’t look like you. Ask them what they need and listen. Initiatives like the Global Shapers “Davos 50” and the Open Forum are movement in the right direction, a chance for some of us to start to shatter these ceilings and be a part of the conversations that will impact our future. I’m grateful for my “Davos 50” who joined me on this journey, for letting me cry when I felt broken, for showing up when I felt like I had no one, and for sitting in silence with me when I had nothing left to say — even when they were fighting battles of their own. 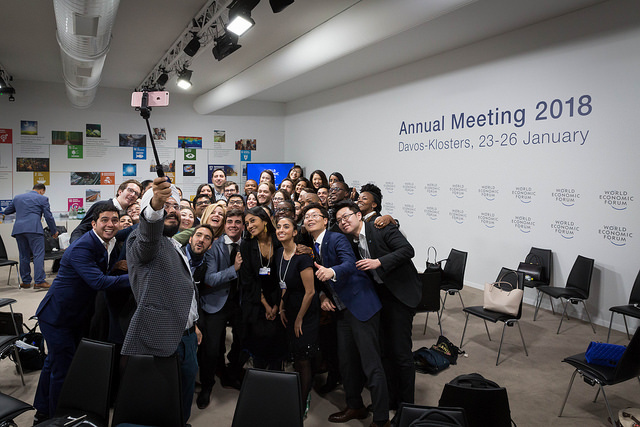 Global Shapers at the Annual Meeting 2018 of the World Economic Forum in Davos, January 26, 2018. A lot of people have asked me what the outcomes were of the Annual Meeting. And to be honest, I don’t have an answer for them yet. In the meantime, I’m still fighting. Note: I hesitated to hit publish on this piece. The last thing I want to do is disrespect the hosts who invited me and provided me this opportunity and platform. I find that due to complicated dynamics of power and privilege, we all too often silence ourselves. My story is not atypical and your voice is power and hope for so many others (like this one). Any views or opinions represented in this post do not represent those of people, institutions or organizations that the author may or may not be associated with in a professional or personal capacity, unless explicitly stated. I love and admire the work you are doing @Tiffany Yu! How can people get involved with the World Economic Forum to attend and potentially be a speaker? Hi @Bethany Heinrich, thanks for reading! I attended through the Global Shapers and to be honest, I'm not sure how I would have been invited otherwise (hence once-in-a-lifetime :-) ). Sometimes there are side events where you can get invited as a speaker, which would give you access to events and venues outside of the main venue. The Global Shapers team pitched us as speakers to another team at WEF, so I wasn't involved in speaker curation. Thanks @Tiffany Yu! This looks amazing. So awesome you got to go. Founder of Diversability. Social entrepreneur. Ex-Goldman Sachs. Founder of Diversability. Former Goldman Sachs investment banker turned social entrepreneur. Featured in Forbes, The Wall Street Journal, The Huffington Post, Fortune Magazine, and more. Graduate of Georgetown University. Based in San Francisco. Tiffany Pham and 3 others upvoted this. DIGITAL MARKETING FOR LAWYERS. WE GENERATE LEADS. YOU PRACTICE LAW.